It's no secret I love me a good spy story. The problem is that the comics world has, surprisingly, not a whole lot of good ones. Oh sure, we get a few odds and ends here and there, and I treasure each one that we get, but often they don't run long, or they tend to gloss over the sorts of stuff I find fascinating. Greg Rucka's "Queen & Country" wasn't short and it wasn't afraid to get down to the nitty-gritty. 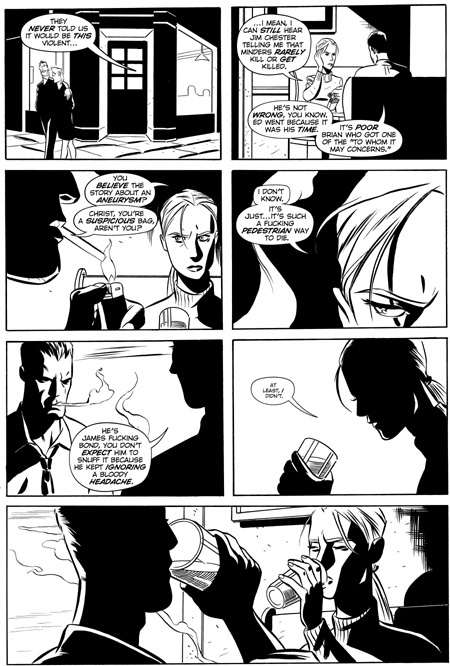 The series ran from 2001 to 2007 from Oni Press, and focused on SIS, the Special Intelligence Service for Her Majesty's Government, aka England. The main protagonist is Tara Chace, one of the Minders, aka the field agents. Q&C draws its inspiration from a British television show called "The Sandbaggers," which aired from 1978 to 1980, when its creator, Ian Mackintosh, mysteriously disappeared. Seriously, you have no idea how much like a spy story the man's disappearance is. According to reports, he and two others were flying over the Gulf of Alaska, they made a short unscheduled stop at an old WWII era disused airfield, then shortly after, send a brief mayday signal and vanished. The report was that the plane had crashed and all aboard were lost at sea. But there have been a bevy of unanswered questions about that day, wreckage was never found, and a guy even wrote a book about it. The prevailing theory is that Mackintosh is either living a new life somewhere or defected to Russia. No one's really sure. The hope was that there would be more clarity in 2013 after some things were declassified, but I haven't seen any real updates, so it looks like his fate is still unknown. How cool is that? Part of the appeal of both Q&C and Sandbaggers is that they are very authentic portrayals of espionage work, i.e. there's lots of office work, planning, sitting around, discussing things, in addition to the more standard action fare. Sure, James Bond is the go-to for showcasing big splashy set pieces, but actual espionage work has a lot of sitting and waiting, having to be ready, for when those moments of action do occur, they're often sudden and without warning, and there's no time for hesitation. It's hurry up and wait in the best and worst possible way. And the office politics, oh man, don't get me started. You think your office has complicated squabbles... imagine if you knew that everyone you were arguing with was a trained soldier with high intelligence, excellent marksmanship and occasionally flexible morality, as needs might call for. And then throw in the fact that the government you work for doesn't often know what to do with you or your team, isn't sure they're making the right calls, wants to think about things forever, wants to second guess you and your information, and reserves the right to insult you if anything goes wrong, whether or not you listened to them in the first place. It's not just a nest of vipers, it's the whole damn pit. Another part of what makes Q&C so compelling is Chace herself, who is both highly capable and an utter mess, as it feels like many people in the espionage field are. We see Chace, warts and all, being dangerous and smart, and yet still coping with personal problems and political struggles. After the series' conclusion, Rucka's written three novels continuing the stories, but I've always felt that Q&C sung better in illustrated format. That said, there's been the potential of a movie circling around for a while, with Ellen Page supposedly in negotiations to play Chace, and a director officially being announced in March, but as with all comic book translations, I won't believe a word of it until I hear the movie's actually filming. Q&C isn't the only successful espionage comic, but it's certainly had one of the longest runs, and it's easy to pick up, in 4 collected volumes, and all three novels are easily available as well.